Although these integrations aren't required to collect satisfaction feedback from tickets, we still recommend setting them up so you can take full advantage of ConnectWise's ticket workflows and business rules. Click the Authenticate with ConnectWise button and follow the steps to add your credentials. Once you do this, all Simplesat/ConnectWise integrations will become available. 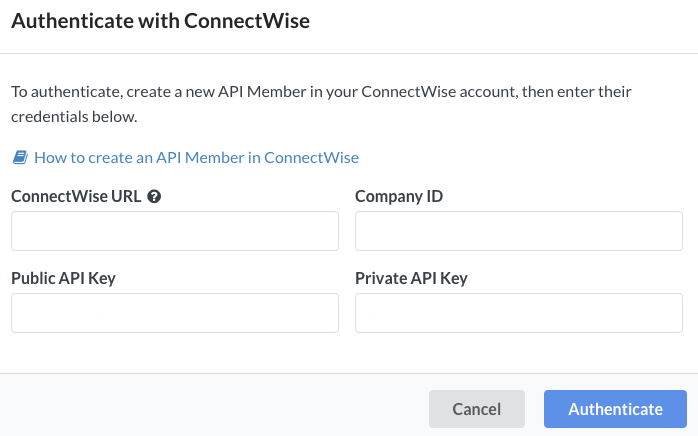 📖 Learn how to create a ConnectWise API Member. Make sure the ConnectWise URL doesn't contain https:// or any trailing slashes. For example, cw.example.com . Our servers are located in Ireland. If you're having an issue connecting, you may need to add that country to your firewall's filter. You may also need to whitelist Simplesat's IP addresses. You can find them here. If you still can't authenticate, please send a message to the Simplesat team and we can troubleshoot together. To completely revoke access and disable all integrations, click the Revoke Access button. This integration will stay active as long as you have Simplesat authenticated with ConnectWise. Note: All information gathered through the API will override fields previously sent through URL parameters. SimpleSat can update the support ticket with an internal note after a customer submits feedback. The note is flagged as Internal, with the ticket's current Contact as the author. Ratings will be displayed as Good, Neutral or Negative. The additional Comment row will only appear if a comment was given.